An elderly woman, who fell prey to a romance scam, is out of hundreds of thousands of dollars and three Greater Toronto Area residents have been charged with the swindle allegedly tied to an international criminal organization. It’s alleged that the 63-year-old woman was defrauded of nearly $609,000 last year, leaving her financially ruined. In August 2014, the Toronto Police Mass Marketing Section started a fraud-related investigation and evidence recovered identified the existence of the victim, who was allegedly conned in the first half of last year. 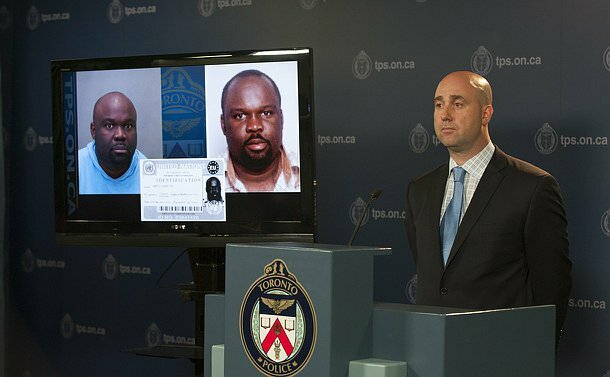 At a news conference at police headquarters on October 22, Detective Sergeant Ian Nichol said Toronto Police investigators worked with the FBI and the United States Postal Inspection Service after significant linkages were uncovered during their investigation. On October 7, Financial Crimes members, with assistance from Peel Regional Police, executed a search warrant at a Mississauga residence and arrested Ikechukwu Amadi, 34. Akohomen Ighedoise, 41, and Lineo Molefe, 31, both of Toronto, were also arrested, the same day, for their respective roles and were jointly charged with offences in relation to the romance fraud allegedly committed against the elderly victim. The trio are charged with fraud over $5,000 and laundering the proceeds of crime, while Ighedoise is also charged with participating in a criminal organization. Nichol said that, during the course of the investigation, it became apparent that he was a member of “Black Axe,” a transnational organization with affiliates in major cities across the world. It’s alleged that he was actively laundering the proceeds of crime with/for other “Black Axe” members for monetary benefit. It’s alleged that Ighedoise used the alias Martin Acker Jr. and claimed to be a United Nations representative. The ruse was supported by the use of forged UN identification by Ighedoise dating back to 2011. Ighedoise made a court appearance, today, while Amadi was released on bail and Molefe was released on recognizance at the time of arrest. Detective Constable Mike Kelly said the victim is economically devastated. Kelly encouraged family members to stay in contact with elderly relatives to ensure they are not victimized. Based on their own investigation and assistance from Toronto Police, the FBI recently indicted six individuals in a vast wire-fraud and money-laundering conspiracy where they allegedly attempted to defraud victims of more than $5 billion. Ighedoise and Amadi are among the six who have been charged and U.S. law enforcement has expressed their intention to seek extradition once the Canadian cases are closed. Additional U.S. indictments are expected. Anyone who has had dealings with anyone using the name Martin Acker Jr. is asked to contact D/Const. Mike Kelly at (416) 808-7824. Anyone with information who wishes to remain anonymous can contact Toronto Crime Stoppers at 416-222-TIPS (8477), online at 222tips.com, text TOR and your message to CRIMES (274637). Download the free Crime Stoppers Mobile App on iTunes, Google Play or Blackberry App World.